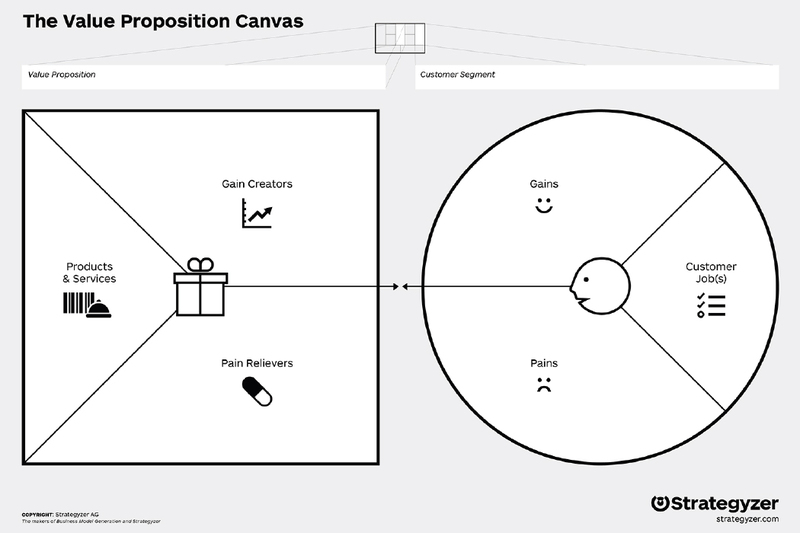 The Value Proposition Canvas is a strategic management and lean startup tool created by Strategyzer that allows to design, test and implement value propositions. It supports the Business Model Canvas by focusing on the 2 most important building blocks of a Business Model: the Customer Segment and the Value Proposition. When the Value Proposition match the characteristics of the Customer Segment, we have the so called Problem-Solution fit. If there is a real market need for that Problem-Solution fit and customers wants it (it gets traction), we then have the so called Product-Market fit. – Jobs (tasks, problems, needs) a customer is trying to perform in order to achieve a functional, social or emotional benefit. – pain (undesired costs, situations, negative emotions and risks) a customer could experience before, during or after getting a job done. – gain (functional utilities, social gains, positive emotions and costs saving) a customers requires, expect, desire or would love to have. It describes which features of your value proposition (Product or Service) will address your customers most important jobs, pain and gains by eliminating pains (Pain Relievers) and creating benefits (Gain Greators). The Value Proposition Canvas can be used by individuals or in groups where people can jointly discuss business model elements with post-it notes. It is distributed by Strategyzer AG and can be used without any restrictions for modelling businesses even though it has been released with a slightly more restricted use guideline of copywright.